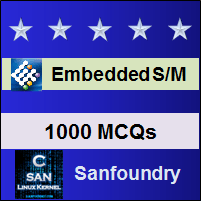 This set of Embedded Systems Multiple Choice Questions & Answers (MCQs) focuses on “Introduction of Interrupts”. Explanation: The interrupts are the most important function of the embedded system and are responsible for many problems while debugging the system. The time taken to respond to an interrupt is called the interrupt latency. 2. Into how many parts does the interrupt can split the software? Explanation: The software interrupt can split into two parts. These are foreground work and background work. 3. Which of the following allows the splitting of the software? Explanation: The interrupt can make the software into two main parts and these are foreground work and background work. 4. Which part of the software is transparent to the interrupt mechanism? Explanation: The interrupt mechanism is transparent to the background software, that is, the background software is not aware of the existence of the foreground software. 5. Which part of the software performs tasks in response to the interrupts? Explanation: In the foreground work, the tasks are performed in response to the interrupts but in the background work, the tasks are performed while waiting for an interrupt. 6. In which of the following method does the code is written in a straight sequence? Explanation: In the spaghetti method, the code is written in a straight sequence in which the analysis software goes and polls the port to see if there is data. 7. Which factor depends on the number of times of polling the port while executing the task? Explanation: The data transfer rate can determine the number of times the port is polled while executing the task. 8. Which of the following can improve the quality and the structure of a code? Explanation: The subroutine can improve the quality and the structure of the code. By using the polling method, as the complexity increases the software structure rapidly fall and it will become inefficient. So the subroutine method is adopted. 9. Which of the following are asynchronous to the operation? Explanation: The interrupts are asynchronous to the operation and therefore can be used with systems that are the event as opposed to the time driven. 10. Which of the following can be used to create time-driven systems? Explanation: The interrupts which are asynchronous can be used with systems that are the event as opposed to the time driven. 11. What does ISR stand for? Explanation: The data transfer codes are written as part of the interrupt service routine which is associated with the interrupt generation by the hardware. 12. Which can activate the ISR? Explanation: When the port receives the data, it will generate an interrupt which in turn activates the ISR. 13. Which code is written as part of the ISR?